The year 1842 was a significant one in French history because a child was born who would grow up to be a very active, energetic and athletic young man. His parents named him Jules. He grew up in the city of Toulouse, where his father operated a swimming pool and taught gymnastics. A bridge over the river that flows through Toulouse, France, present day. Jules was a handful and his parents had to keep an eye on him as he climbed up and onto anything available to him and tumbled across the ground in delightful play. As Jules grew into adolescence, his father noted his enthusiasm for swinging on ropes and tree branches. In a brilliant piece of parenting, he erected a trapeze above the pool he operated and began training his son in the art of the trapeze. As Jules practiced, his mishaps in the air resulted in nothing worse than a splash in the pool. Jules grew into a very good looking young man. His wide shoulders, muscular arms and trim waist were the envy of many men, and were admired by many women. By the late 1850s he was a popular aerialist in the circus in Paris. By the 1860s he was traveling to London, England, to perform. The trick that made him famous was, for its day, amazing to behold. He began on one end of five suspended trapezes and performed four consecutive aerial somersaults. This was Jules’ great contribution to circus performance history: the “aerial somersault.” He is widely credited with inventing this gymnastic feat. Here is a You Tube video of a circus performer doing a triple somersault on the trapeze. Even more important, however, was a contribution Jules made to the history of fashion and sportswear. Let’s face it. Jules had become a star and he was very proud of the muscular proportions of his body and the admiration it created, especially in women. 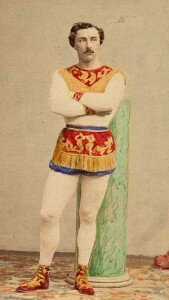 This being the high Victorian era, with its strict morality and disapproval of any bare arms or legs being displayed in public, Jules designed a snug fitting costume that covered his arms and legs but was a radical departure from previous circus attire. It was tight enough to stimulate the imaginations of the many women who came from near and far to see him perform. It was also a clever way to attract even more people, both men and women, to attend his performances. Here Jules poses for a photograph showing off his “radical” new piece of clothing. It showed off his physique, much to the delight of his female admirers. His new “threads” had another, more practical value: it allowed his body to move freely and eliminated any fear that a part of his clothing would get tangled in the ropes of a trapeze. It was a winning situation all around, for both him and his audiences. Jules Leotard in Paris, 1867, three years before his death. Jules Leotard’s revolutionary garment spread from circuses and acrobatic shows to gymnastic competitions and then, beginning in the 1920s, it began to influence the look of swimsuits. As “flappers” rebelled against the draped swimwear of their Victorian mothers, they adopted swimsuits that revealed their legs and arms in a daring way. Victorian swimsuits from the late 19th century. Note that arms and legs are fully covered. 1920s bathing beauties showing off the more daring swimsuits of the early “Jazz Age.” This style was influenced by the invention of the “leotard” by Jules Leotard two generations earlier. Note: the arms and legs are out in the open. As the century progressed the “leotard” took its place as a standard garment for those participating in dance and, later, it became a common uniform in exercise classes. Nearly 150 years after his death Jules Leotard’s name is firmly established in our contemporary culture. It is spoken countless times each day. We hear it but have forgotten his story. Take a moment to remember him. or are at a dance concert and see this,…think of Jules Leotard.